Newts exposed to caged or free-swimming mosquitofish laid fewer eggs than newts not exposed to the invasive species, suggesting that chemical or visual cues alone were sufficient to alter the behaviour of gravid newts. Our results suggest that mosquitofish can reduce the reproductive success of native pygmy newts in the wild, highlighting the need for management efforts to mitigate this impact. Leer más. We show that none of the diagnostic characters used by Valverde to differentiate between A. hidalgoi and A. marchi are actually diagnostic, as we found high levels of variability on those characters in the studied specimens. Our results validate Boscá's description of A. hidalgoi, which fits within the morphological variability observed for southern Iberian Algyroides. As a result, we propose the strict synonymy of A. marchi Valverde, 1958 with A. hidalgoi Boscá, 1916. Leer más. Video en el que se explica la construcción de un paso para anfibios en carretera y su improtancia. Ir al enlace. About 81 percent of recorded snake strikes were accurate, yet the snake actually bit the kangaroo rat in just 47 percent of the strikes and latched on long enough in just 22 percent of strikes to actually kill and eat the kangaroo rat. 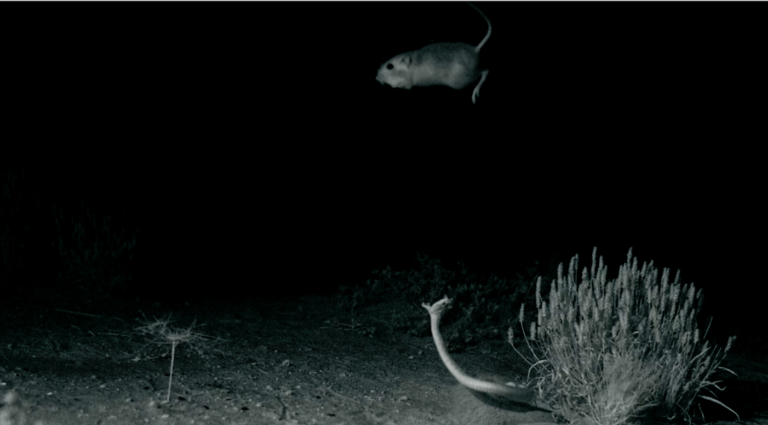 The slowed-down videos demonstrate the importance of kangaroo rats' physical features, including long tails and powerful legs, and mid-air maneuverability in escaping predation. Leer más. Sortida herpetològica a Gallecs, en el marc del projecte “Herpetofauna i Bioseguretat”.